Press the TITLE button while listening to an RDS capable station. RDS INFO ON appears, and the station name is displayed. 1. 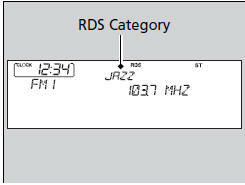 Press the CATEGORY bar to display and select an RDS category. Switching the Audio Mode Press the MODE button on the steering wheel. You can store six AM stations and twelve FM stations in the preset buttons. FM1 and FM2 let you store six stations each. 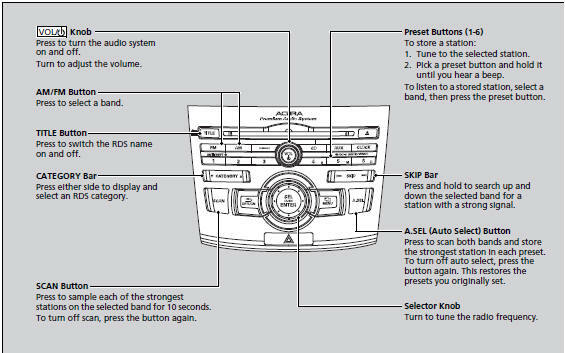 A.SEL function scans and stores up to six AM stations and twelve FM stations with a strong signal in the preset buttons. If you do not like the stations auto select has stored, you can store other frequencies in the preset buttons manually.